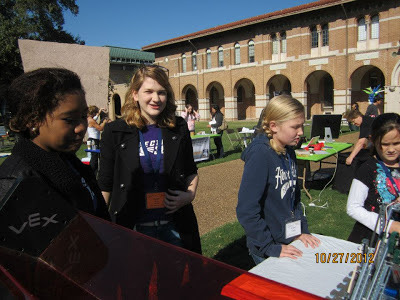 Spectrum had its last event of the 2012 FRC season on Saturday (10/27). The inaugural Houston Robot Remix took place at College Park HS in the Woodlands. Thanks to Texas Torque (FRC#1477) and all the volunteers that made the event possible. Spectrum had a great time competing with UltraViolet one more time this year. There were only 20 teams at the event so every team got on the field at least 8 times during qualifications. Our drivers weren't rusty at all and came out of the gate firing on all cylinders. In our first five matches we went 4 - 1 and were looking good to be a top seed at the event. The last three matches of the day proved to be a bit tougher and we lost all three of them partly because we had our main breaker malfunction. After a quick replacement we were ready to go for the elimination matches. We were selected by the third seed in the tournament, the home team, Texas Torque (FRC#1477). We rounded out our alliance by selecting the Shadetree Mechanics from Killeen, Texas (FRC#3999). In our first elimination match we put in place a strategy that involved Shadetree defending and feeding ball back over to our side of the field. Torque was designated our main scorer and we collected balls and fed them to them while they were in place to score. This strategy worked perfectly and we won that match 78 - 1. The next two matches went downhill when our Driver Station laptop stopped recognizing our driver's inputs. We found the problem was a malfunction with the USB hub driver but by that time it was too late and we were down a match to the number 1 seeded alliance in the semi-finals. We put up an awesome fight in the last match but when Shadetree got stuck on the bridge there was too little time for us to work in a new balance and we lost 60 to 65. Overall it was an excellent tournament that introduced a lot of people to FRC and gave a lot of students more experience. You can watch the webcast archive of the event here. Thank you to Houston FIRST for sponsoring such a great an event and making it free for local teams. We can't wait to come back next year. Spectrum had the great privilege of having Katie Strausser, a St. Agnes Engineering Team alumnus, visit the team on Monday (10/22). Katie graduated from St. Agnes in 2003 and attended Carnegie Mellon University. She received her BS in Mechanical Engineering (w/ minors in robotics and Computer Science). From there she went on to UC Berkeley for her Masters and PhD in Mechanical Engineering with a focus in Control Systems. Katie is now developing the control systems for eksoskelton robots with Ekso Bionics. These machines are designed to help people with spinal cord injuries and also have military and industrial applications. You can view Katie's full presentation to the team on our YouTube Chanel. This past Saturday (10/20) was day 2 of the inaugural Houston VEX League. The event was held at the Scott Collegiate Academy in Galveston, TX. Spectrum had both our robots on hand and was ready to show off the improvements we had made of the past two weeks. We also had six of our members volunteer at the event as referees, field support, and queuers. By the end of the day both our machines were performing very well; the drive train improvements had us moving much faster across the field. Due to the hard work of our team members our sack collection, autonomous modes, and game strategy improved throughout the day as well. We finished the day 10th and 17th out of 31 teams. Below is the only match were both our teams got to play on the same alliance. You can view the rest of the recorded matches form the event at this link. Official match results and current rankings from the event our posted here. Thank you to everyone that helped put on a great VEX event in Galveston. Next stop for the Houston VEX League is Beverly Hills Intermediate, Pasadena ISD on Nov 9th and 10th for the final qualifying rounds and the elimination tournament. The schedule and more information can be found here. Don't forget to watch the webcast. 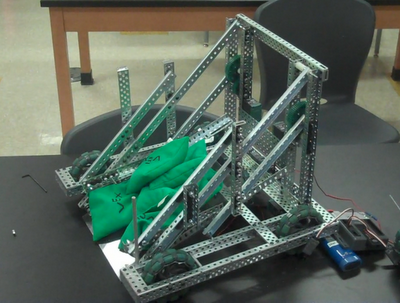 This past week was spent mostly on making improvements to the VEX Robots for the Houston League Competitions. We're working on making our drive train faster and getting in more driver practice so we will be able to perform our match strategies more efficiently. On Saturday (10/13) we had members of our team volunteered at the North Houston BEST Robotics event. We don't compete in the BEST competition anymore but we are still invested in supporting local robotics programs in all forms. The team worked as referees, time keepers, field rest crew and helped fund raise for the event. Spectrum is also partnering with the Harris County 4H. 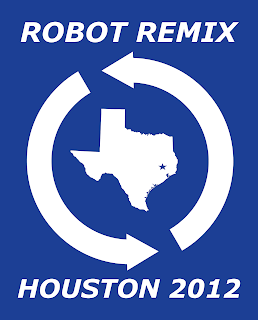 Harris County 4H is putting on a robotics competition for 10 Houston area elementary and middle schools. This Sunday (10/14) we worked with a local Lowe's Store to build each of the schools a folding robotics table. Coming up we have the 2nd event of the Houston VEX League in Galveston this Saturday (10/20). 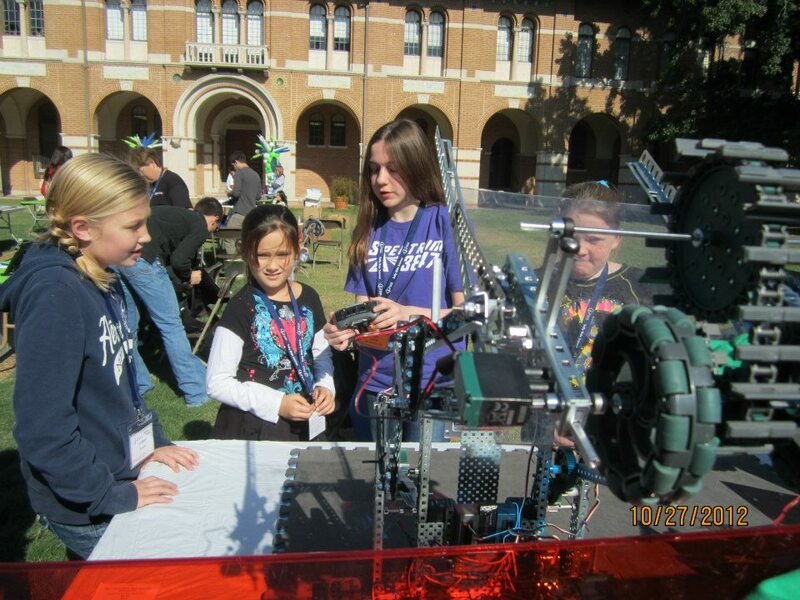 Saturday, Spectrum hosted the 1st day of the Houston VEX League at Strake Jesuit College Prep. It was an awesome event with over 30 teams competing. The teams came ready to compete with some excellent robots to play Sack Attack. The rankings from the event can be viewed at this website. Currently our two teams (3847A and 3847J) are ranked 15th and 16th. You can view matches of both robots as filmed by our team here. The archived webcast of the event can be found here. Thank you to all the volunteers for doing a great job making the event go very well. Also thank you to the teams for cleaning up after themselves at the end of the event it made the event tear down much easier. The next VEX League event is Oct. 20th at Austin Middle School in Galveston All the teams are going to get at least 10 qualifying matches so the rankings can change greatly. Look for a lot of robot improvements between now and the 20th. 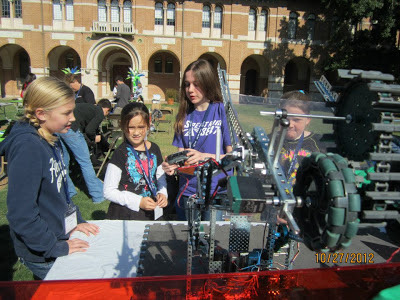 We're hosting the first event of the Houston VEX League this Saturday (10/6) at Strake Jesuit College Prep. We'll have over 25+ teams from across the Houston area competing in qualifying matches. These teams will than head down to Galveston on the 20th and finally to Clear Creek ISD on November 9th and 10th to crown Houston VEX League Champions. Here is a photo of one of our robots. It's still missing its collector and it needs to be wired up before we can do full tests. The second robot is a bit further behind but should be ready for the competition as well. We still need to add a few sensors and get the programming together as well but the main goal of the first event is to make sure the robots work than we will have three months to improve everything before the regional on December 1st. Last Friday we continued our Mentor for a Day program by having Jose Lopez, Senior Design Engineer from Mitsubishi Caterpillar and representative from the American Society of Mechanical Engineers, here to speak with us about his engineering projects and why he enjoys engineering. "Usually we talk about whatever is the most urgent question right now. Sometimes, especially early on, the most urgent question is to figure out what the most urgent question should be." - Paul Graham, What Happens at Y Combinator, February 2012.